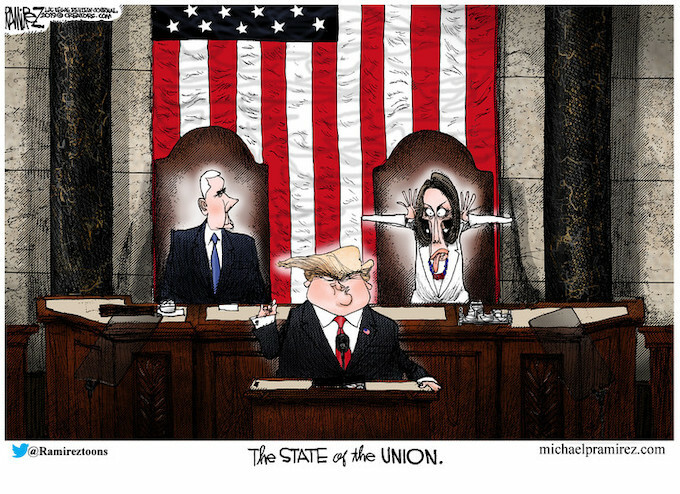 I have NEVER seen a sitting President treated with as much disparagement, disdain, and open ridicule in an official function as I saw during President Trump’s SOTU address. Nancy Pelosi’s little mocking clap (not to mention other reprehensible behavior from House democrats) is being hailed by the media as the highlight of the evening, but in reality, it is just the final demonstration that the democrat party serves only themselves and cares nothing for the country, the people, or our way of life. The Speaker of the House, openly mocking the President of the United States during the State of the Union Address?! I hope I live long enough to see these democrats heads mounted on pikes along Pennsylvania Avenue as the final proclamation that we will NEVER accept a Communist/Marxist/Socialist United States! It’s like the Democrats are praying for the iceberg to hit while we’re all on the Titanic, just because they hate the captain and want to see him go down with the ship. Screw the people; screw the economy; screw America — we just want to see Trump fail, no matter who gets hurt! Pity we can’t just take them all, onto a ship, leave it out in the ocean to get sunk.. Remember “The only thing necessary for the triumph of evil if for good people to do nothing.” That is where we are at. People elected Trump and then went back to sleep. We need to wake up and stand up, or we are lost. So true Wayne. We saw what that ‘going back to sleep’ cost us in nov last year..
Another really awesome cartoon by Ramirez. I love his work. The facial expressions are priceless! As for being lost how can we explain that over half our countrymen support this horror? How is abortion not a modern form of the worship of Moloch? The rest of us for the most part are very similar to the citizens of Berlin during the 30’s and 40’s as long as things don’t get to bad I guess I’ll just ignore it. They ignored it until it was to late. I very much fear that is it already to late. We can sit in our homes and play with our guns while those in the chambers of our gov’t slowly strip away our humanity. We seem to be slightly shocked when we discover it is not our elected officials that actually run the gov’t apparatus. Most of us know that the military is not run by the officers but by the senior NCOs. It is not the guys who have shown up in an office and will leave in a few years but the 15 and 20 year guys who know where all the bodies are and know how to operate w/I the system and most of them are dems. It is the result of the marriage between the public unions and the dems. I guess that defines the deep state. I think the sergeant-at-arms should have been called to REMOVE that senile, demented old BAT from the House chamber for her antics. Have you EVER seen anybody behave in such a CHILDISH fashion at a State of the Union address? That paper shuffling, reading-while-Trump-was speaking, remaining standing after everybody ELSE sat down and the President resumed speaking was designed to distract people’s attention AWAY from the President and the TRUTH he was telling that she didn’t want ANYBODY to hear, and she deserved a punch in her UGLY botoxed face for that little “clapping” performance of hers. If THIS is the Dem’s idea of “reasoned” discourse, they need to just go away and STAY away. The sooner this TOXIC, America-hating bunch of LOONS that is today’s “Democrat” Party is cast on the ash heap of history where it belongs, the better! If I were Pres. Trump, I would hold my State of the Union address SOMEWHERE ELSE for that last two years of his Presidency, and make sure that hateful, vindictive, CHILDISH is NOT invited! Pity we can’t cast THEM onto that ash heap, in PERSON, only proverbially..